Two road projects were completed adjacent to the Rapid River, which flows into the Torch River as part of the Elk River Chain of Lakes. The first was Kellogg Road and Rapid River, where a stormwater conveyance channel (3,600 feet), infiltration ditch, and stabilized outlet to the river were installed. The second was along Hanson Road where a 1.8-acre sediment basin was constructed to capture sediment from road runoff before entering Rapid River. We estimate that these projects prevent 780 tons of sediment from entering the Rapid River each year. 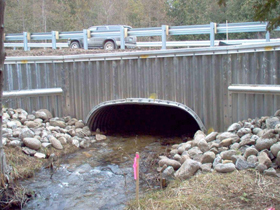 The Watershed Center assisted in the improvement of the Roubal Road and Bellanger Creek road crossing in Leelanau County (just north of Suttons Bay). 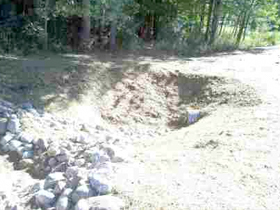 This site was experiencing moderate erosion stemming from two undersized culverts that were too short for the width of the road and not properly aligned with the creek crossing. There was also sediment eroding off the road both at the crossing and the approaches that run down through a ditch into the creek. Our CMI funds were combined with other funds to replace the culvert, stabilize the streambanks, and re-grade and pave Roubal Road. The Watershed Center contracted with the Grand Traverse Conservation District to address sedimentation and runoff coming from the Deal Road crossing of Battle Creek, which empties into Elk Lake. The biggest problem on Deal Road was that the culvert/grader blades are too short for the width of the road. Apparently when the road washed into the creek many years ago, the road commission stuck a piece of culvert on the end of the grader blades that were used originally when the road was constructed. 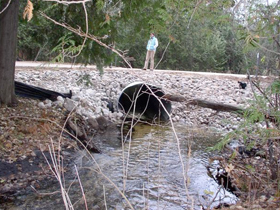 Our CMI funds were used to replace the culvert, stabilize the outlets, and re-grade and pave the road.